In the Fall of 2015 the second floor of the library became available 24/7. 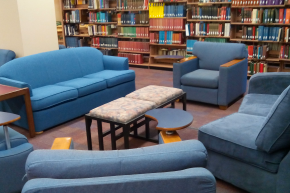 The second floor provides a variety of seating choices including computer access, large tables, soft seating, and individual study space. 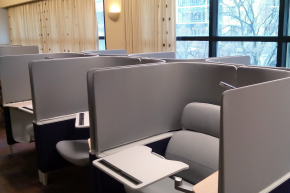 In January 2016 we introduced new individual Brody study carrels. Providing high performance comfort and support, the Brody pods feature patented lumbar technology—bringing ergonomic design to the lounge posture. The adjustable work surface holds technology at eye level. The pods also include a built-in task light, power outlets, arm and foot rests, and under-seat storage. 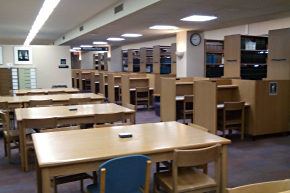 The Brody carrels were funded through the generosity of the Friends of the Weinberg Library.